The shift, telegraphed weeks ago by disclosures that the effort had produced only a handful of trained rebels, is meant partly to take better advantage of U.S. airpower, which can play a bigger role now that Turkey is permitting American fighter jets to operate from its soil. But it is not expected to immediately give new momentum to a slow-moving — some would say stalled — American-led campaign against the Islamic State. The aim is to work with established rebel units “so that over time they can make a concerted push into territory still controlled by ISIL,” said Pentagon press secretary Peter Cook. Others said the hope is to put much more pressure on the northern city of Raqqa, the Islamic State’s declared capital. The administration is under heavy criticism in Congress for a flawed approach in Syria, amplified by Russia’s muscular moves to launch ship-based cruise missile strikes and deploy fighter aircraft and battlefield weaponry — actions that caught the U.S. by surprise and underscored the failure of the Pentagon’s $500 million program to train and equip rebels. 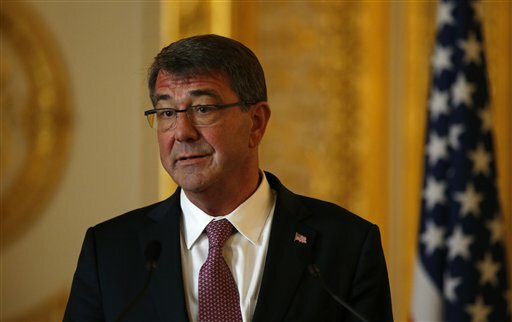 Defense Secretary Ash Carter said Friday the new Pentagon approach is in line with the administration’s basic formula of leveraging U.S. and coalition airpower by coordinating with anti-IS Syrian rebels on the ground. The U.S. has had success working, for example, with Syrian Kurds and Sunni Arab rebel groups in northern Syria. The U.S. believes a capable ground force is essential for success against IS, but those troops will not be American. “I remain convinced that a lasting defeat of ISIL in Syria will depend in part on the success of local, motivated and capable ground forces,” Carter said in a written statement. Yet the Islamic State continues to make gains. On Friday, militants captured a string of villages near Aleppo in a lightning attack that brought them closer to the prized city in northern Syria. Administration officials said the new Pentagon approach focuses heavily on equipping and supporting Sunni Arab rebel groups that the U.S. military has been coordinating with in recent months as they, along with Syrian Kurdish rebels, take and hold ground east of the Euphrates River. The Pentagon will provide leaders of these groups with ammunition and communications gear while vetting them for links to terrorism, and then call on them to identify and pinpoint Islamic State targets for airstrikes. Only the rebel groups’ leaders will be vetted, whereas the abandoned training program included an arduous requirement that every individual fighter be screened. The idea is to begin small and then build up the level of U.S. support for these established rebel groups, based on their performance. Sen. John McCain, a frequent critic of Obama’s Syria policy, said Friday that continuing to insist that rebels fight only against the Islamic State is a “fundamental flaw” of the revised U.S. approach. “This problem, compounded by the administration’s immoral refusal to protect those we train from Putin’s bombs, could doom this new effort to the same failure as the previous one,” McCain said. Christine Wormuth, the Pentagon’s policy chief, told reporters that the effort to train and equip a new rebel fighting force, as intended when the program began early this year, is being “paused” but might be restarted one day. The new aim is to “work with groups on the ground who are already fighting ISIL and provide them some equipment to make them more effective, in combination with our airstrikes,” Wormuth said. Congress approved $500 million for the program but much of that is unspent. As of May, $41.8 million had been spent, according to the Pentagon’s latest public accounting. An official familiar with the program said Friday that the total is now close to $300 million. The official was not authorized to discuss the details and so spoke on condition of anonymity.